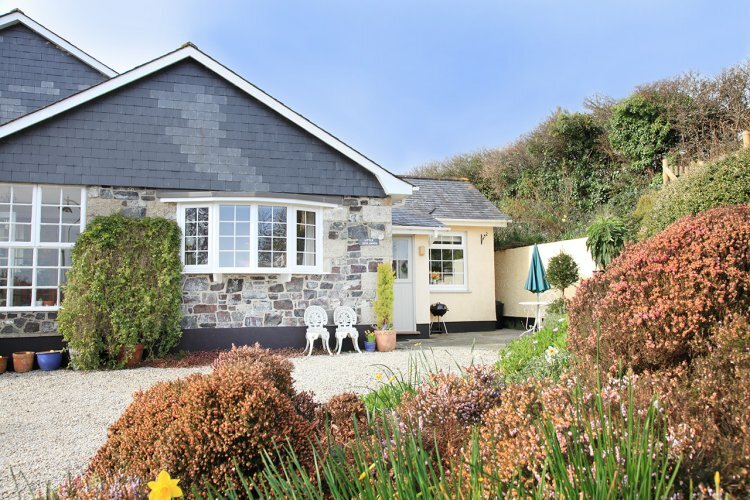 'Little Scol Garth' is a spacious annexe set just above the pretty fishing village of Porthallow. Sleeping two in comfort with off-road parking, patio area and garden all just a 300m walk down to the beach and popular Five Pilchards Inn, which is recommended to book in advance. Short Breaks available between October and the end of March, please select under 'Duration' on the search facility, or call 01326 240 333. Porthallow is nestled around a sheltered cove surrounded by rolling countryside, it's also considered the half way point of the South West coast path with miles of walking and stunning scenery available in either direction.Little Scol Garth is a 2 minute walk from the coast path. The nearby, larger village of St Keverne has another two good pubs, a convenience store, Post Office and quality butcher. Entered through your own porch to the well-equipped kitchen which has an electric oven with 4-ring hob, fridge with freezer compartment, dishwasher, microwave, kettle and toaster. There's also a table and three chairs so you can dine inside or out on the patio. The living room has two sofas, one of which is a sofa bed suitable for one child (please call to enquire), 40" TV with DVD, a flame effect heater and a bay window looking out to the countryside views. Books and board games are available for your use. The shower room has a large cubicle with electric shower, a toilet, handbasin with mirror and shaver socket over and a heated towel rail. The bedroom has a super king-size bed which can be made into twin single beds by prior request . For storage there's a built-in double wardrobe, a further built-in storage cupboard, bedside table with lamp and a dressing table. A lovely outdoor seating area benefits from catching the sun for most of the day and has a charcoal barbecue, there's also a lawned garden area for guest use which is bordered by a planted rockery. For dogs, both the beach at Porthallow and nearby Porthoustock welcome dogs all year. Two well behaved dogs will be accepted by prior arrangement at £25 per dog per week. Towels and a blanket are provided for your dogs. The owners live in the main house and have two friendly dogs who are kept in their separate garden. There is a locked door joining the lounge to the owners house otherwise the annexe isn't overlooked and shares only the gateway onto the drive. In the owners garage there is a washing machine and tumble dryer available for guest use.